Hey y’all, welcome to Sundress month on the blog! In the past, I’ve done 30 Days of Sundresses every June, but this year is going to be more low key here with most of the action taking place on Instagram – where you can join in! Check out my Instagram feed to find out more. 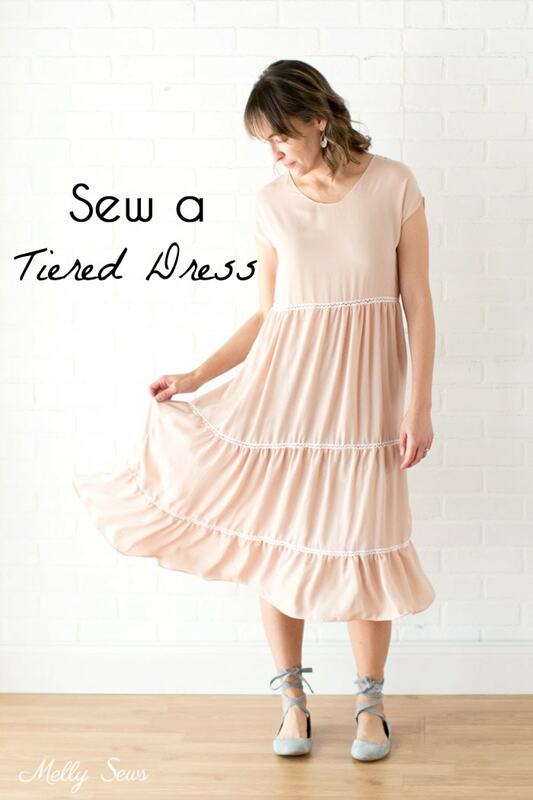 Today I’m sharing a tutorial for a tiered dress. 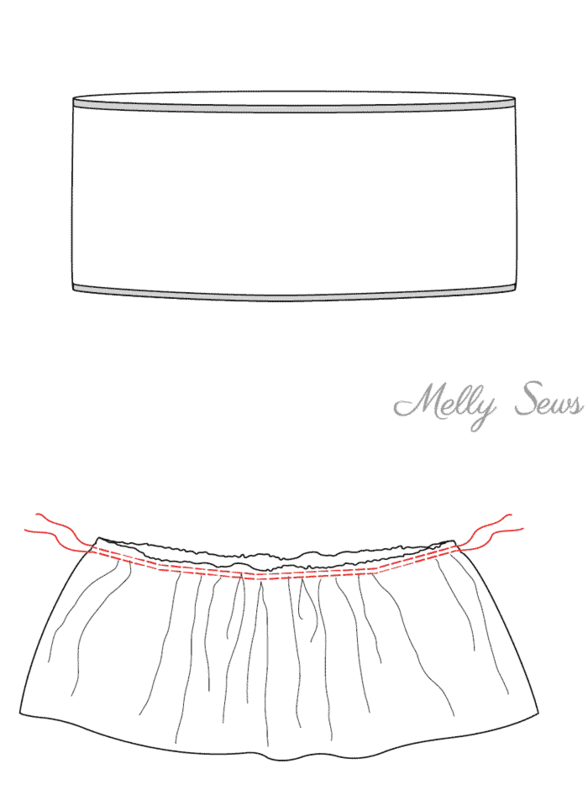 This one starts with my Blanc T-shirt pattern and adds on tiers of skirt with lace insets between each row. Want to make your own? Start by getting the Blanc Pattern. Then you’ll need another two yards of fabric or so – it depends on your size. I suggest using a fabric with a lot of drape. This one is made out of a polyester crepe that is semi-sheer, so I do wear a slip underneath. Rayon challis would also be lovely, as would cotton voile, silk and maybe even lightweight linen. First, crop the t-shirt pattern at the waist. Then size up 1-2 sizes, depending on where you fall within the pattern measurement range. If you’re near the top of the measurements for your size, go up 2 sizes. 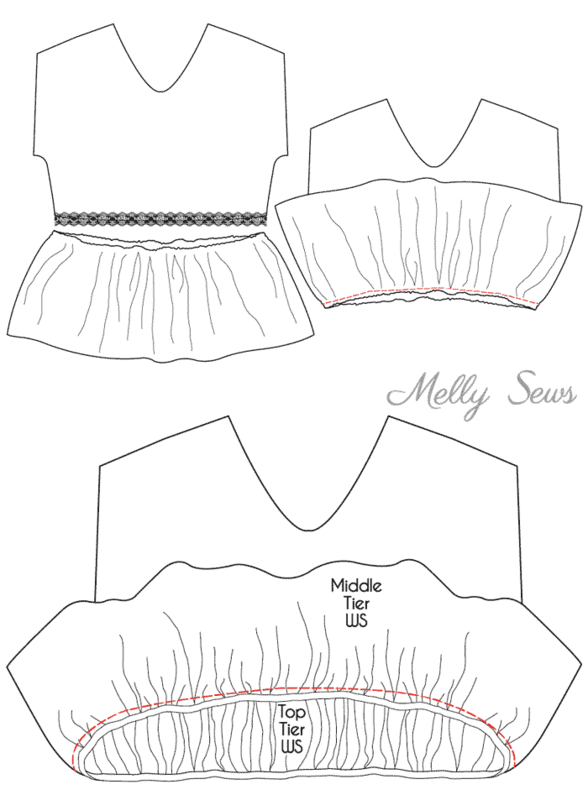 Sew the top according to the pattern instructions, except skip the bottom hem. To figure our your tiers, you’ll need to do a little math. Measure the bottom edge of your t-shirt. Multiply that number by 1.5 for Tier 1 length. Then multiply Tier 1 length by 1.5 for the Tier 2 length. Finally multiply Tier 2 length by 1.5 for the Tier 3 Length. So for example, my top measured 32 inches. Those are the circumferences for each tier. The heights I used were 12 inches for Tier 1, 10 inches for Tier 2, and 7 inches for Tier 3. Of course you can adjust to make your final dress longer or shorter, or even leave a tier off. You will have to piece several cuts of fabric together to make tiers 2 & 3, and possibly even tier one. While piecing, try to make the pieces equal size. So to piece my Tier 1, instead of a 44″ wide cut and a 4″ cut, two 24 inch cuts are better. If you want to do the lace insets (which are optional) you’ll also need lace that is the length of the bottom of your shirt, Tier 1 and Tier 2. Double edged non-gathered lace works best, in any width you like. Sew each of your tiers into a loop. If you’re doing the lace insets, you need to hem both edges of each loop. I did a small rolled hem, but that may not work with every fabric. Rolled hems can be difficult over seams, so you may find it easier to just turn the smallest hem you can instead. Gather each tier along the top edge. If sewing lace, sew a loop to the bottom of your shirt. Then place Tier 1 right sides together with the waist of the shirt, gathered edge aligned with the waist edge. Stitch. Repeat with Tiers 2 and 3. If you didn’t hem Tier 3 before, do so now and you’re done!